The Dolores Aguirre bull-ranch featured in the fourth running of the bulls of this year's Sanfermin in a run that was marked by the memory of the young Madrid runner, Daniel Jimeno, who died in the running of the bulls on the 10th of July last year. He was fatally caught by a bull at the top of the final stretch leading into the bullring. Today's run was frenetic and dangerous as the pack of bulls loosened quite early from the first stretch in Santo Domingo and the bulls ran the rest of the course separated from one another. As this is the weekend, the course was packed with runners, but the bulls ran at a very fast pace and they completed the 900-meter course in just 2:53sec. There were a lot of trip-ups and falls, both for the runners and for the bulls, along the whole stretch of the run. Luckily, there were no injuries from the horns of the bulls, and just four people were taken off to hospital for treatment for various bruising and contusion. Unlike the usual pattern, today's pack of bulls began to separate almost from the beginning of the course and as soon as they came out of the pens in Santo Domingo. One bull came totally to a halt half-way up this stretch and another bull coming behind charged into it and pushed it into moving forward again. The bell-oxen all pulled away together and left the bulls coming up loosely behind as the bulls began to separate even more. At the City Hall stretch and into Mercaderes, the bell-oxen continued to lead the field with four bulls coming up behind them. The other two bulls were further back and running close together. There were lots of falls and trip-ups and the mass of runners made it difficult to get close to the horns of the bulls. As the bulls moved up Estafeta Street, the gap between the separated bulls got larger and the bell-oxen continued to run ahead of the bulls. Some fine running was displayed here, but mostly there were too many runners looking for the same space in front of the horns. A lot of runners continued to trip-up and fall all along this stretch. 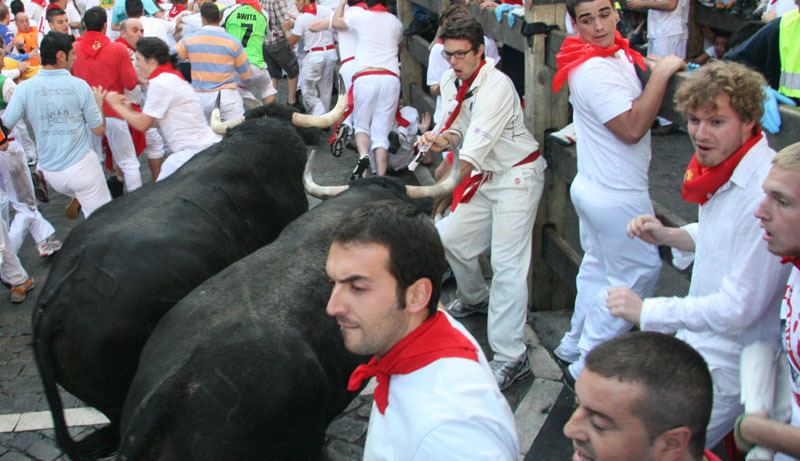 The bulls continued to run at a very fast pace and entered the bullring separately. The bullring was crowded with runners but the bulls ignored them as they entered one by one. They never threatened to charge the runners and once inside the arena they all made their way quickly to the safety of the pens on the far side of the arena. 15 running bulls. 14 goring. 51 traumatisms. In 11 this was the 4th time that the Dolores Aguirre did not cause any gorings. In 11 participations the Dolores Aguirre have caused 38 injuries from bruising (3,45 per running of the bulls). In their 11 participations the Dolores Aguirre have always run under 5 minutes.